I’ve had the pleasure of interviewing Eva Wymm from Mofa, to learn more about the concept of her athleisure brand! Find out more about the incredible vision she has for her company and it’s relationship to physics below! DD: Where did the idea for Mofa first originate? EW: It started with streams of consciousness during college, writing, drawing figures in clothing, some in galactic landscapes, others on Earth. Mofa is based on appreciating human existence by contemplating us from outer space. This broader perspective tends to expose easily and intensely our miraculous experience. The name itself came up for the first time in 2012. It’s Gangster, it had to be. Mofa is a brave and friendly word. DD: Do the color schemes of the jumpsuits (using blue, black, magenta) have a specific significance to you, or the brand? EW: Well, they are are cool colors with less energy, creating a subtler impact on our fields of vision. I sought to contaminate as little as possible. I like the blue because it’s shiny and galactic. We call it Galaxy Blue, it matches so well with outer space. Black is a relevant color in the zeitgeist of contemporary urban life. Black is the color of The Force. And also the city. And of course Black is also very galactic. It’s the color of the Universe. DD: You have a very intriguing hanger that comes with each purchased jumpsuit, would you like to tell us more about it? EW: Yes! 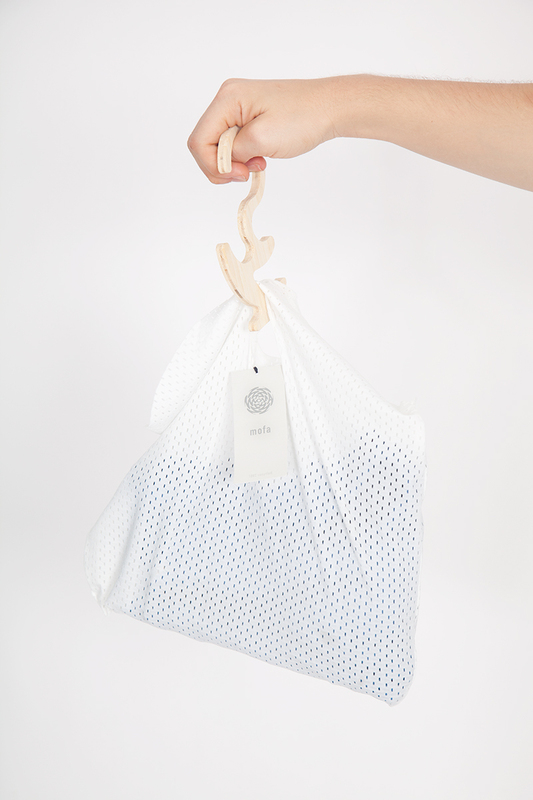 The Mofa hanger (and mesh bag) included with every purchase is all about creative architecture. The brand wants to create an experience for us. Jumpsuits can hang vertically on the hanger and dry there after washing them with us when we shower or in a bucket with water and some soap. The Mofa hanger hangs jewelry, belts, pants, all sorts of stuff. 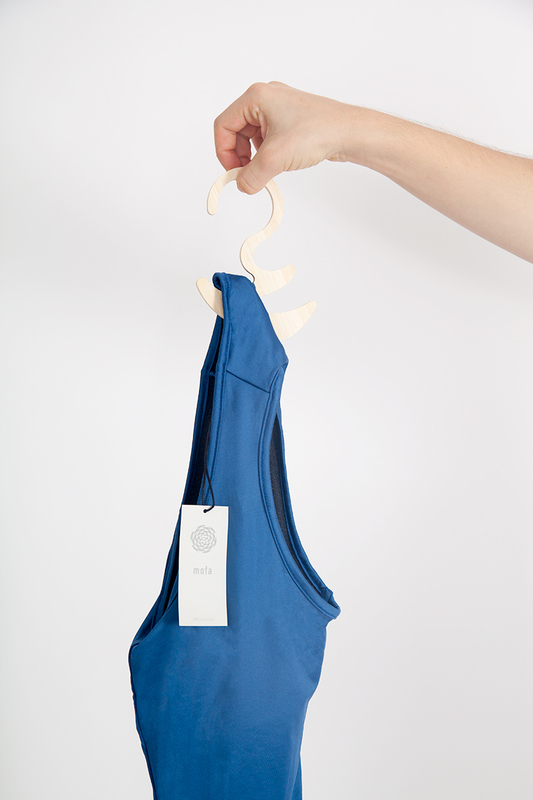 It’s awesome to save space and make it beautiful with a 100% bamboo hanger. Out-of-the-box design can be a serious tool for integrating our well being with our functional environment. DD: What would you like to tell us about your logo design? DD: “Own less, do more,” is part of Mofa’s motto, correct? Can you delve into this a little more for our readers? EW: We sell clothing and want people to benefit from it, but there is a greater message regarding the accumulation of personal items. Own less so life isn’t complicated or expensive. Lessen the impact of consumerism. Opting for richer experiences we can bring in more happiness and peace. DD: Eugenia, I absolutely love the video which shows different clips from around the world that you have on your website landing page. To me, it seems as if it’s narrated by an unknown being in outer space observing earth, and the human race. Is this the idea? What more did you have in mind while creating it? EW: That was a great project. It shows a Mofa perspective, Superheros! An outer space observer is impressed by human senses from our hands, ears, mouth, eyes, and nose. He acknowledges to an extraterrestrial Kaptain traveling on a spaceship that humans are “the Superheroes of legends.” It pays tribute to being human. That’s what Mofa is about, paying tribute. DD: Mofa is the “hub of information and connectivity”, but can you tell us more about how this comes into action, and how you’re utilizing the jumpsuits and Mofa as a platform to build community? EB: We started with clothing because it’s the first element of design in our lives. And with jumpsuits because they are very Mofa, since they are the outfits of astronauts and superheroes. A lot more is coming. On the blog articles topics include community, healing, and architecture. We want to build a community informed on the magic of our planet, well-being and happiness. DD: What environmental or conscious aspects are there about your company? Or how is Mofa helping to improve the fashion industry? EW: With regards to the fashion industry, we support owning less, buying less, for lower production and consumption levels, we buy organic and recycled when we can. Our environmentally conscious approach offers design that engages our sense-awareness. DD: What other pieces can we expect from Mofa? EW: In the short term menswear and more variations for our womenswear athleisure. An essential oils blends project is in the works. Our Mofa experience also involves bags, tents, stairs for trees… We currently sell healing crystals. And we will offer Mandala prints to color soon, these are really good for the soul. Please check them out Mofa on Instagram and follow the company’s design journey! Great interview! I love these pieces; they’re so different from anything I’ve seen before! Thank you! Yes eva has a very unique style. I love her original designs! Awesome pictures and interview. Love the term athleisure! Thanks for sharing. Wow! I love these outfits! They’re unlike anything I’ve seen! So so cool. Thank you so much for introducing me to Mofa!! Thanks! So glad to hear that you like Mofa too! I have never heard of this brand before, but thanks to your interview, my wishlist just got longer because this brand has some seriously cool outfits that I need in my life! They are so cool! Fit for superhero! Whenever you get one tag me and Mofa so we can see how you wear it! Thank you! Her designs are great. I can’t wait to see what more she comes out with! These are such cool designs! Loved reading the interview.